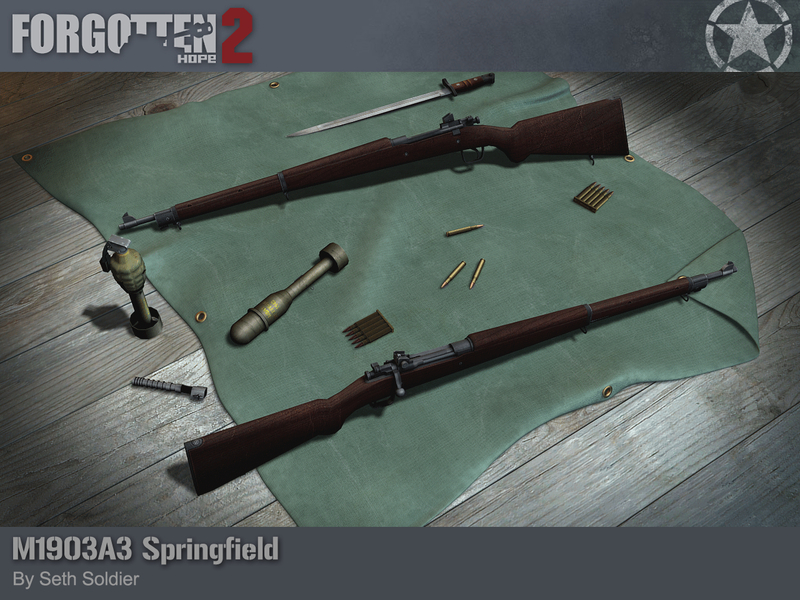 Today we have a render of a new rifle that will be equipping the United States forces, the Springfield M1903A3. While the US entered the war with the M1 Garand as its standard infantry rifle, there were the inevitable shortages and delays that lead to the M1903 Springfield rifle seeing widespread use in the first few months. In anticipation of this, production of the Springfield was re-continued in September 1941 using vintage tooling stored since 1919. As this started to wear out, many milled parts were replaced with cheaper stampings, and the original ladder sight on the barrel was replaced with an aperture above the bolt. Called the M1903A3, the rifles with these changes would see frontline service alongside the Garand, particularly seeing use for launching rifle grenades and with the Rangers. Our M1903A3 has been made by Seth Soldier.